To express a desire for; ask for! Got a specific pairing you would like to read about? Eri/Risa? Miki/Hitomi? JunJun/LinLin? Got a specific genre/story you'd like to see written out? Monkey see; monkey do: Ask and yee shall receive (maybe)! Readers, use this thread for requests. Authors, if you see a request you'd like to take up- just say so and start writing! This is an excellent topic! And a storyline where basically Eri and Risa are together and the hardships they have to go through with the rest of the MoMusu's and their graduation together because of their relationship (H!P's ruling). I'd like to request a fanfic about jphip members and celebrities. Like what would daigong do with Joe Rogan and Rika Ishikawa on Fear Factor? daigong will make out with Joe Rogan and left Rika crying beside the Fear Factor's shooting set. ^ i alr read it..haha..
Longer than 5000 words at least...I love a great read. The only RULE is that, the feelings have to develop in the story. I like following the characters and being able to feel their emotions as they grow. No jumping into relationships or sudden unrequited love. Now there is a real challenge. Emotional roller coaster with Yurina being the strong one (obviously). no death please. Mention of other couples of Berryz too if possible. Preferably, Miyabi x Chinami, Maasa x Maiha and Saki x Momoko. Would like to see Chinami make Miyabi her real girlfriend. Eh heh! But 90% Yurina x Risako. Same theme like the first one. I love GAM the best but I've read the best fics about them here to be satisfied (Not) so I like a change in a menu. Strangely, most other fics I've read that have Reina and Miki in them, these two had great Chemistry. they sure didn't mind playing around with each other. Should be when Miki was the leader this time around please. Oh, and TanaEri fans, please, hold the stones. Anyway, chances are no one will pick these up but....The dream stays strong. PS:, If anyone has read fics about these two couples, please not even a second before sharing. For I haven't found even one yet. Needs to dig deeper. Hopefully, there is a great author out there looking for a great challenge. 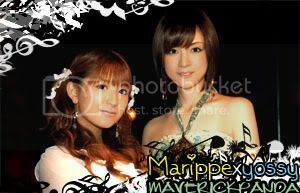 ^ Just a wee bit of Reina/Miki for you, but hey, some is better than none right? Damn, had to go all the way to the 3rd page to find this!! It's been waaaay too long! But I'm back with a perv-ish thing!!! As usual, I'll take comments either here or there! It was really short but the first one I've read so I loved it none the less. Just one Yurina/Risako will do....Just one. Hmm, y'know Yurina/Rii and Reina/Miki would make a decent amount of sense to me. As well as Chinami/Miya... they seem to be close irl. I suppose I'm one of those guilty of making Reina and Miki "play around" a decent bit in my fics. Actually in CotD it goes a bit more than playing around... though I can't necessarily say much in the way of feelings are there. Hmm, y'know Yurina/Rii and Reina/Miki would make a decent amount of sense to me. As well as Chinami/Miya... they seem to be close irl. You agree too!? I am surprised since you seem to be waaay out there as a great fan of Miyamiya and Risako. In fact, I would say you're the no.1 here. LOL. I suppose I'm one of those guilty of making Reina and Miki "play around" a decent bit in my fics. Actually in CotD it goes a bit more than playing around... though I can't necessarily say much in the way of feelings are there. Oh great, now here I go and read this one again. Damn it rokun, why you do this to me! Wrrry! Okay, I forgive you for...whatever. I shall wait for as long as it takes. I shall. We'll see, maybe some new challenges like you've mentioned will give me some inspiration to start writing more again. I'll probably have the time, especially come winter/spring. or both of them help each other in dangerous situation.